SETTING: The three largest international credit rating agencies are Fitch Ratings, Moody's Investor Services, and Standard and Poor's. These agencies' credit ratings cover the global spectrum of corporate, sovereign, financial and other public entities and the securities and obligations they issue. The analytical frameworks used to produce these ratings are referred to as credit rating methodologies. METHOD: A review of Moody's ratings for South African corporate entities was undertaken to examine claims of a sovereign ceiling influencing the external ratings obtained by these institutions in emerging markets. This article assesses the applicability of credit ratings provided by the three (primarily) US-based rating agencies (Moody's Investor Services, Standard and Poor's, and Fitch Ratings) in assigning creditworthiness of corporate entities in emerging markets. When a corporate client approaches a bank for a loan, the bank assesses the creditworthiness of the corporate. More specifically, the bank must assess the risk involved in the specific transaction, usually by establishing a credit rating for the corporate. This is an inherently difficult exercise because corporates seldom fail, so default data are sparse. However, it is important to model these rare events as accurately as possible because of the effect corporate failures could potentially unleash on the country's economic milieu. Many factors are considered in the assessment of risk from the bank's point of view; one example is: if the corporate is part of an international conglomeration, would the parent provide implicit support for the loan or not? Most banks have established their own internal rating systems to deal with these sorts of problems, which allow them to establish credit ratings that can be converted into a probability of default (PD) estimate, which could be used in subsequent pricing and capital calculations. External ratings can also be used in these internal rating systems. 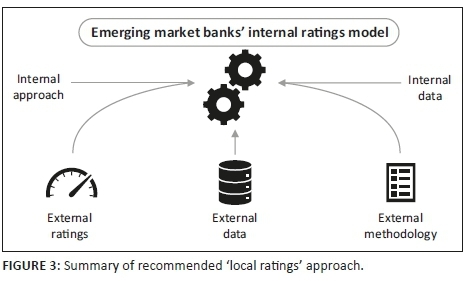 External rating agencies rate emerging entities by taking a generic global lender's view (i.e. the ratings are not conditional on the lender type or position) and take only into account the borrower and transaction characteristics. The ratings issued by the external agencies also seem to depend on the sovereign rating through a full or partial application of sovereign ceilings. Emerging markets' sovereigns typically have low credit ratings and the corporates within such a country are almost always ranked at the same level or lower. Providing suggestions on the incorporation of agencies' data and methodologies into internal ratings models. The three largest international credit rating agencies are Fitch Ratings (Fitch), Moody's Investor Services (Moody's) and Standard and Poor's (S&P). These agencies' credit ratings cover the global spectrum of corporate, sovereign, financial, and other public entities and the securities and obligations they issue (for more detail see Fitch 2014; Moody's 2016b; S&P 2016). The analytical frameworks used to produce these ratings are referred to as credit rating methodologies. Several methodologies that relate to a particular industry, sector, class of issuer or transaction exist and each methodology could result in one or more rating types (e.g. global issuer rating, PD rating, bond fund ratings, counterparty risk assessment ratings). Furthermore, an issuer rating can be split into various categories (e.g. long term, medium term, short term, domestic, foreign, secured and unsecured). Taking Moody's as an example, the agency has more than 600 methodologies with more than 100 rating types. Santos (2012) provides a summary of the generic corporate methodologies used by Fitch, S&P and Moody's. The analytical framework, or rather the credit rating methodology, establishes the key analytical factors that the agency believes are the most important determinants of credit risk for the relevant sector. All three of the major credit rating agencies use their own methodologies, but in general they are similar. Quantitative as well as qualitative assessments of various criteria are used, followed by a process of weighting and tweaking, which finally results in a single rating score. The two main factors considered are economic and political factors. Economic factors may relate, among others, to income levels, international trade involvement, level and composition of debt, economic structure, flexibility and growth. The political dimension includes, for example, political stability, the history of debt-related policy actions, and the degree of democratisation or quality of institutions. Moody's Sovereign Rating Methodology (Moody's 2015b), for example, uses four key factors to determine the sovereign risk: economic strength (e.g. GDP per capita), institutional strength (e.g. inflation levels), fiscal strength (e.g. government debt as a ratio of government revenue) and susceptibility to event risk (e.g. political risk). 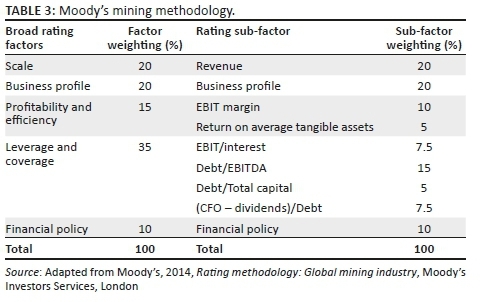 Moody's Mining Rating Methodology (Moody's 2014, 2018) uses five key factors to determine a mining corporate's credit rating: scale (e.g. revenue), business profile (e.g. competitiveness), profitability and efficiency (e.g. Earnings before Interest and Taxes [EBIT] margin), leverage and coverage (e.g. debt/earnings before interest and tax and amortisation [EBITDA]) and financial policy (e.g. financial risk tolerance). The common use of the term 'credit rating' normally refers to global credit ratings. The terminology used by Moody's (2016b) is 'Global Scale Ratings' (GSR). These include all of the rating types and are intended to be comparable across industries, markets, obligation type, countries and geography. Such a credit rating is the evaluation of credit risk in order to rank an institution's ability to honour its debt obligations. Credit ratings issued by agencies are relative rankings of creditworthiness, meaning that an issuer or issue with a higher ranking is considered to be of better creditworthiness than an issuer or issue with a lower ranking (S&P 2016). The agencies themselves make it clear that ratings should be regarded as opinions, not facts, and therefore cannot be described as 'accurate' or 'inaccurate' (Fitch 2014). While global credit ratings are intended to provide a measure of relative creditworthiness of institutions across industries and countries, national credit ratings are also issued for some of the institutions with global credit ratings. National credit ratings provide a measure of relative creditworthiness of institutions within a specific country. The terminology used by Moody's (2016b) to indicate these types of ratings is 'National Scale Ratings' (NSR). Fitch uses the term 'National Ratings' (Fitch 2014) and S&P refer to 'National Scale Credit Ratings' (S&P 2016). Moody's assigns NSRs to provide greater differentiation among a country's issuers when GSRs are concentrated in the lower portion of the scale, typically for emerging economies. The NSR can be mapped to the GSR rating, using the sovereign rating of the particular country as the anchor point. Note that NSRs have no inherent absolute meaning in terms of default risk or expected loss; rather, they should be regarded as ordinal rankings of creditworthiness relative to other domestic issuers within a given country (Moody's 2016a). A historical PD or an expected loss consistent with a given NSR can be inferred from the GSR that was used at that specific time, since these mappings are documented by the agencies. However, both the PD and the expected loss of an NSR may change if and when a country's national scale is remapped (Moody's 2016a). Credit rating agencies typically rate all institutions within a country at or below the sovereign rating. A few exceptions exist, but then the institution is not ranked higher than at most two notches above the sovereign rating. The principal reason is that sovereigns are viewed by the agency as the lowest credit risk in their local market or currency (Moody's 2015a). Although rating agencies deny the strict application of sovereign ceilings to the global credit ratings of corporates in the particular country, it is typically the case as shown in Sections 4 and 5. Rating agencies' ratings should not be considered accurate, even by their own accord, and are intended as opinions about the riskiness of entities. Although agencies stress that their ratings should be regarded as opinions and that they cannot be evaluated as 'accurate' or 'inaccurate', many studies conclude that the external ratings should definitely not be regarded as 'accurate' (see e.g. Fourie et al. 2013; Fuhrmann 2011; Haspolat 2015; Nguyen & Knyphausen-Aufseß 2014). Guidelines given by the Prudential Regulation Authority (PRA) of the United Kingdom on the use of external agencies' ratings in the internal ratings-based (IRB) approaches expect firms using external agency ratings to still have their own internal rating scales and use all other relevant information (PRA 2015). The PRA specifically warns not to automatically assign obligors ratings based on the external agency ratings. They further expect the institution to ensure that it does not adjust its individual ratings with the objective of making them closer to the external ratings, as this would be counter to the philosophy of an internal rating approach (PRA 2015). In emerging markets, the corporate ratings are heavily influenced by sovereign risk through the application of a sovereign 'lite' ceiling. Literature opposes the use of unmodified external agencies' credit ratings to determine the creditworthiness of local institutions for local lending, specifically in emerging countries. Several authors (e.g. Luitel, Vanpee & De Moor 2016) claim that the agencies favour their home countries and corporates, alleging that the ratings for other countries and especially emerging markets tend to be conservative. Yalta and Yalta (2018) show that credit rating agencies indicate a strong home country bias towards the United States while there seems to be no special biases against an individual group of countries. The application of the so-called 'sovereign ceiling', applied when agencies rate in-country corporates (Borensztein, Cowan & Valenzuela 2013; Mohapatra, Nose & Ratha 2017), also influences emerging market ratings. Borensztein et al. (2013) regressed S&P corporate credit ratings against four sets of components: dummy variables indicating specific year, industry and country, firm-level determinants of idiosyncratic risk, country-level macroeconomic variables that affect the risk level of all firms in the economy, and the S&P sovereign credit ratings. They concluded that sovereign credit ratings remain a significant determinant of corporate credit ratings, more so in emerging countries. Similar arguments are found by Triandafil and Brezeanu (2008), who examined the influence of sovereign rating on corporate rating (emerging versus developed country). Cantor and Packer (1996) note that apart from affecting large sovereign bond markets, sovereign ratings also influence the credit ratings of private firms. Nguyen and Knyphausen-Aufseß (2014) review existing research on the relationship between a sovereign's creditworthiness and corporates within as well as beyond its border. They conclude that studies generally agree that higher sovereign credit risk, as reflected in lower sovereign ratings, is associated with a more restricted access to debt capital for corporate borrowers. Nguyen and Knyphausen-Aufseß (2014) also note that, despite the common agreement that the influence of sovereign on corporate ratings exists, there are still deviating notions on the extent to which this influence manifests itself and that more research is needed on this topic. Ferri and Liu (2002) conclude that sovereign ratings have a particularly strong effect on corporate ratings in developing markets and that a country's information quality influences the relationship. Ferri and Liu (2002) further argue that the sovereign ceiling also has an impact on low-rated firms, as rating agencies wish to preserve the graduation in corporate rating levels. Hence, they contend that 'the sovereign ceiling would tend to push down the scale of private ratings rather than affecting only those firms that are right against the constraint'. This observation somewhat contradicts the claim of Durban and Ng (2005) who state that the ceiling only bears relevance for firms with ratings constrained by it. Borensztein et al. (2013) confirm the presence of a sovereign ceiling 'lite' policy by the agencies and conclude that it tends to affect corporate ratings negatively. Other studies focus on the sectors that are more severely affected by sovereign creditworthiness (Nguyen & Knyphausen--Aufseß 2014). For example, Nguyen and Knyphausen-Aufseß state that, while the export-oriented resources sector is barely affected by sovereign credit risk, the telecommunications sector and the financial sector (both with close regulatory ties) are more likely to be sensitive in this regard. Export-oriented resource sectors like mining firms are predominantly influenced by the industry in which they operate (rather than the country), because mining firms' profits are consistent across the industry, being commodity-price driven. These arguments might be true in most developed economies, but in some emerging economies, specifically in South Africa, mining firms' profits are driven by two main factors, namely commodity prices and currency (i.e. exchange rate, which relates directly to sovereign risk). No research was found on how these region weights differ between emerging and developed economies. Lewis (2015) suggested a framework to analyse the sovereign credit risk exposure of financial institutions. Nguyen and Knyphausen-Aufseß (2014) also mention the dependence of financial institutions on their government's creditworthiness in times of a financial crisis. This is again confirmed by a recent newspaper article by Bloomberg (Oyamada & Mathis 2018), stating that money managers say rating actions are mostly backward-looking - referring specifically to emerging markets. Although the focus of this article is the assessment of the creditworthiness of corporates by banks within an emerging market country, some remarks on the differences between in-country and cross-border lending should also be made. When considering cross-border lending, an additional risk, namely transfer risk, might arise. Transfer risk is when government imposes restrictions on the transfer of funds by debtors in a country to foreign creditors (Claessens & Embrechts 2002). This phenomenon is almost exclusively related to foreign currency exposure when involved in cross-border lending. Nguyen and Knyphausen-Aufseß (2014) list some examples of transfer risk: governments in financial distress may impose foreign currency payment restrictions on corporations; they may expropriate private assets or impose higher taxes on corporations to compensate for higher sovereign borrowing cost, thereby reducing corporations' ability to serve their debt; and they can implicitly or explicitly render financial support to private borrowers in distress, that is, grant payment guarantees. Claessens and Embrechts (2002) found that although internal and external ratings (measuring transfer risk and sovereign risk) are driven by similar factors and both underestimate cross-border risk, external ratings are somewhat slower in adjusting to specific events. The agencies' ratings are commonly used by banks because of regulatory pressures, as a benchmark, and for low default portfolios. Adjustments are prevalent. Even where FIRB or AIRB approaches are available, regulators are reluctant to approve internal rating systems in low-default environments, where the performance of the system cannot be explicitly illustrated on data representative of the bank's portfolio. So, although an FIRB/AIRB bank will have internal rating systems, it will often continue using rating agency ratings for sub-portfolios where there is insufficient data to build an internal system. In the remainder of this section, only the Moody's ratings are reported on for conciseness and as illustration. 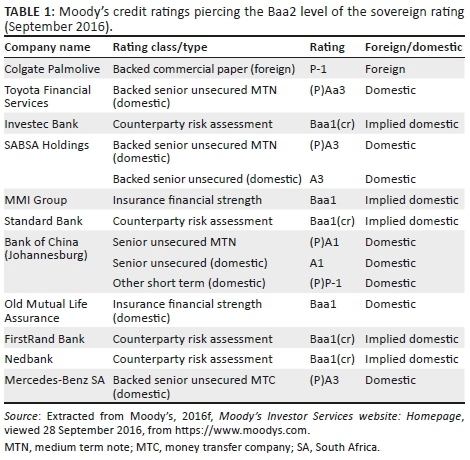 South Africa's sovereign long-term issuer rating (domestic) assigned by Moody's is Baa2. The associated short-term issuer rating (domestic) assigned is P2. Both are part of the lower investment grade broad-risk group. Moody's has assigned 305 ratings to 65 institutions in South Africa. When municipalities and other government entities are excluded from this total, 252 ratings are available for 48 institutions. Of these 305 (252) ratings, 200 (166) are global ratings, of which 37 (20) are global long-term domestic issuer ratings. The sovereign domestic issuer long-term rating of South Africa is Baa2; the short-term rating is P2. None of the ratings that pierce this ceiling are issuer ratings and the comparability of the 'backed' ratings is debatable because the issuer ratings are secured ratings. Note that only ratings with domicile (country) indicated as 'South African' were considered. Even though the country of the Bank of China is listed as domicile 'South Africa', this is not a South African-based company. Some of the Top 40 JSE listed companies appear to have no external rating. An initial analysis indicated that less than 50% of the Top 40 companies are assigned a Moody's/Fitch/S&P rating. Initial analysis also revealed that in some of the Top 40 JSE listed companies, the domicile is listed other than South Africa (e.g. Billiton is listed as an Australian company). When a rating pierces the South African sovereign rating, it is in general only one of the institution's ratings that pierces. For example, Moody's assigned nine global ratings in total to Standard Bank. Only one of the nine assigned ratings, namely the Counter Party Risk Assessment rating, was higher than the South African sovereign rating of Baa2 (or P2), whereas the remaining eight ratings are exactly equivalent to the sovereign rating. Consider rating changes by Moody's for mining and banking institutions in South Africa. The rationale for any rating changes for the mining companies was connected with specific mining factors whereas for banks they were primarily related to sovereign risk. For example, on 16 September 2016, Moody's (2016c) affirmed AngloGold Ashanti's Baa3 rating (changed the outlook to positive from stable), mainly because of an improvement of the debt/EBITDA ratio. Moody's (2016d) also affirmed the Ba1 rating of Gold Fields and changed the outlook from stable to positive, because of the improvement of financial ratios. Moody's remarked that the rating could be adjusted upwards if Gold Fields's cash flow improves. Moody's (2016e) confirmed the ratings of the five largest South African banks to a negative outlook on 10 May. As indicated by the negative outlook on the sovereign rating, any deterioration in the creditworthiness of South Africa would exert downward pressure on the banks' ratings, in view of their sizeable holdings of sovereign debt securities. In addition, the banks' ratings could be downgraded if operating conditions worsen more than currently anticipated, leading to significantly higher loan loss provisions that prompt deterioration in the banks' earnings and capital metrics that exceed the agency's expectations. Conversely, any upwards rating momentum of the banks' ratings is currently limited as their baseline credit assessments are constrained by the sovereign rating (p. 2). Three ways of incorporating external agencies' data and methodologies into internal ratings models are discussed below. The first two are based on the data of peers provided by external agencies such as key financial ratios and relative credit health scores, while the third employs the quantitative rules from the methodologies as a benchmark. 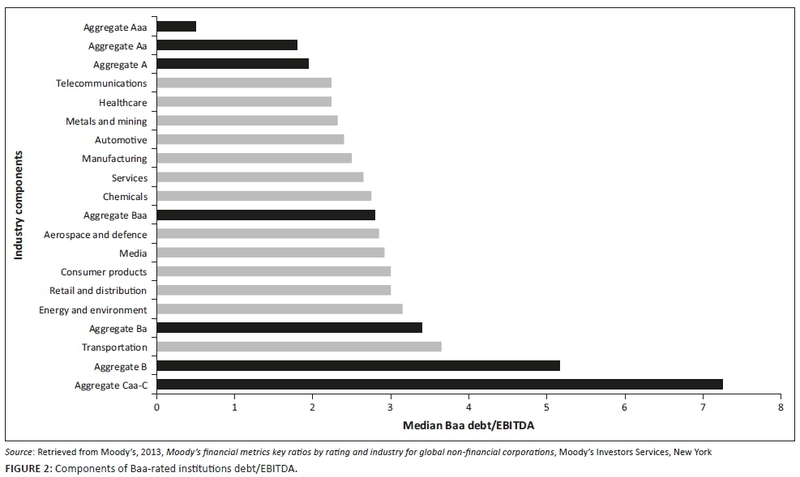 Moody's (2013) outlines key financial ratios across industries for global non-financial, non-utility corporates. For example, the distribution of the median of the ratio debt/EBITDA by broad rating category can be summarised as shown in Figure 1. Note that the telecommunications industry has the lowest median ratio, but it is still greater than the A aggregate. On the other hand, the transportation sector has the highest debt/EBITDA ratio, exceeding the Ba aggregate. 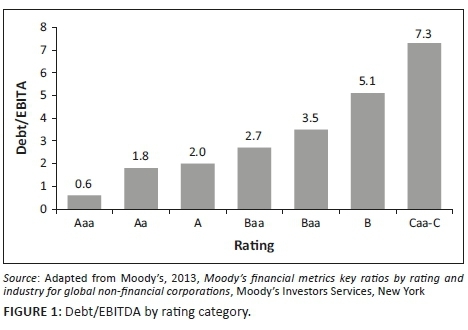 These financial ratios (based on Moody's ratings) can be used to adjust or benchmark internal rating models. Assuming the current internal model uses a debt/EBITDA ratio of '< 0.6' for a risk grade 1. Further, suppose a large transportation corporation received a risk grade of 2 from the internal model, but this company is known (credit analyst and/or expert knowledge) to be of very low risk. Assuming this transportation corporation has a debt/EBITDA ratio of 1.2. From Figure 2 it is observed that the transportation sector has the highest debt/EBITDA ratio and the credit analyst/expert might decide to adjust the level of '< 0.6' in the internal mode to, for example, 'less than 2'. This will result in the specific transportation corporation in our example receiving a risk grade of 1 rather than 2, to more accurately reflect the credit risk associated with transportation corporations. Note that this example is only on how to adjust one financial ratio for one transportation company. This needs to be done by a credit analyst or expert for each company for each financial ratio. Usually the adjustments are done per industry (the same type of suggested adjustments are usually grouped per industry). Nevertheless, the expert will decide if the 'industry suggestions' will be applied for all the companies in a specific industry. In our example above, the 'industry suggestions' showed that in general the debt/EBITDA ratio of transportation companies are higher. The expert needs to decide if this guideline will be applied to all transportation companies and they also need to decide to what degree the guideline will be applied. The Credit Health Score (CHS) (S&P 2013) is a workflow tool designed to aid the evaluation of the creditworthiness of a chosen entity relative to a unique group of industry peers. The key analytical element of the CHS tool is the relative credit health score. The CHS is a relative quartile ranking (top, above average, below average and bottom) that expresses the creditworthiness of the entity relative to its unique peer group. The CHSs are delivered at three levels for each entity: overall score for the entity, financial panels' scores (operational, solvency, liquidity panels) and fundamental metrics scores. The CHS methodology consists of three steps and is summarised below. The second step performs a comparison of fundamental metrics within the peer group. S&P (2013) utilises a total of 24 fundamental metrics to analyse an entity's relative credit health. These fundamental metrics are grouped into three equally weighted panels: operational-related metrics (e.g. EBITDA/revenue), solvency-related metrics (e.g. net debt to EBITDA and debt/EBITDA), and liquidity-related metrics (e.g. total revenue). In Step 3 an iterative scoring methodology is applied. If the financial metric of the entity falls in the first quartile of all the peers (identified in Step 2), two points are added, if in the second quartile, one point is added, if in the third quartile one point is subtracted, and if in the fourth quartile two points are subtracted. This is done for all three metrics (operational, solvency and liquidity) and averaged over these three for a final CHS. The CHS seeks to provide a consistent, quick snapshot of an entity's relative financial performance versus a unique group of peers or companies. Adjusting the internal rating of an entity to an alternative benchmark model created for a sector using the key financial ratios (quantitative rules) used by a rating agency's industry for that sector. 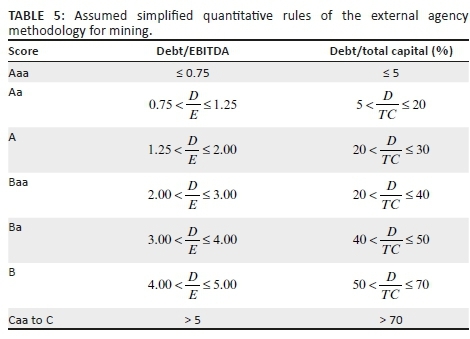 The Moody's Mining methodology (Moody's 2014) (see Table 3). 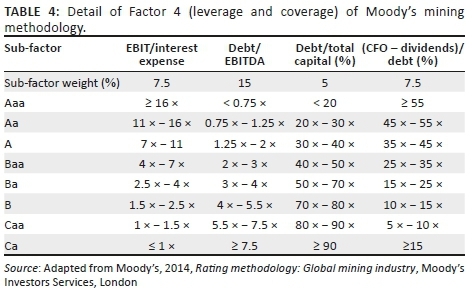 The detail can be found in (Moody's 2014), for example for Factor 4: Leverage and Coverage (35%) (see Table 4). · The external methodology (only quantitative) would give a score of 75% × 3 + 25% × 2 = final score of 2.75 (rounded up to 3). This comparison (internal model's final score of 1.7 vs external methodology, resulting in a score of 2.75) can be used to benchmark the internal rating model or to adjust the internal rating model.